The author here reassesses the concept of ‘masculinity’, and argues that it cannot be seen as an absolute standard, but only as the product of perpetual conflict between competing and unstable models. The argument is sustained by a close reading of the problematic conflict between gendered values in eighteenth-century classical learning. Pope’s Homer ensured the continuation of the tradition of using the Iliad and Odyssey to teach privileged boys how to become more ‘manly’. 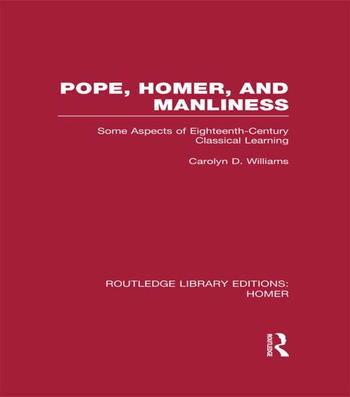 This book examines this pedagogy in its socio-literary context, and concludes that Pope’s Homer emerges as a relic of the struggle to preserve masculine dignity from the encroachments of feminine values in the text. This knowledge of classical and early modern literature has rarely been brought to bear on gender studies. First published in 1993, it remains a valuable contribution to debates concerning the reception of the Classical tradition.